A system created by The Ocean Cleanup, an organization founded by Boyan Slat, a 24-year-old innovator will send a trash collecting device to the Great Pacific Garbage Patch- an island of trash twice the size of Texas. 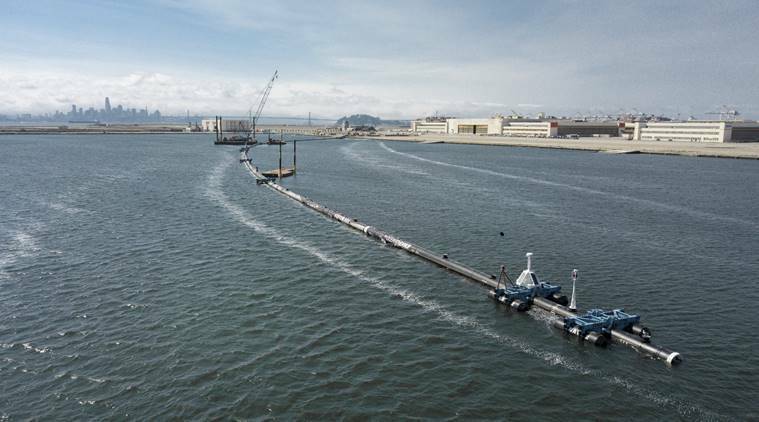 San Francisco: Engineers set to sea Saturday to deploy a trash collection device to corral plastic litter floating between California and Hawaii in an attempt to clean up the world’s largest garbage patch in the heart of the Pacific Ocean. The 2,000-foot (600-meter) long floating boom was being towed from San Francisco to the Great Pacific Garbage Patch- an island of trash twice the size of Texas. Shipping containers filled with fishing nets, plastic bottles, laundry baskets and other plastic refuse scooped up by the system being deployed Saturday are expected to be back on land within a year, he said. Slat said he and his team will pay close attention to whether the system works efficiently and withstands harsh ocean conditions, including huge waves. He said he’s most looking forward to a ship loaded with plastic coming back to port. “We still have to prove the technology… which will then allow us to scale up a fleet of systems,” he said. George Leonard, chief scientist of the Ocean Conservancy, a nonprofit environmental advocacy group, said he’s skeptical that Slat can achieve that goal because even if plastic trash can be taken out of the ocean, a lot more is pouring in each year. Leonard said 9 million tons (8 million metric tons) of plastic waste enter the ocean annually and that a solution must include a multi-pronged approach, including stopping plastic from reaching the ocean and more education so people reduce consumption of single use plastic containers and bottles. “If you don’t stop plastics from flowing into the ocean, it will be a Sisyphean task,” Leonard said, citing the Greek myth of a task never completed. He added that on September 15 about 1 million volunteers around the world will collect trash from beaches and waterways as part of the Ocean Conservancy’s annual International Coastal Cleanup. Volunteers last year collected about 10,000 tons of plastics worldwide over two hours, he said. The system will act as a “big boat that stands still in the water” and will have a screen and not a net so that there is nothing for marine life to get entangled with. As an extra precautionary measure, a boat carrying experienced marine biologists will be deployed to make sure the device is not harming wildlife, Slat said.